On the heels of the Intergovernmental Science-Policy Platform on Biodiversity and Ecosystem Services (IPBES) report about the potentially catastrophic worldwide decline of pollinators, I’d like to offer some gentle reminders to home gardeners and all others concerned about the health and maintenance of our food supply and the natural world as a whole. The report paints a dire prediction of decline and extinction of pollinators–honeybees, wild bees, butterflies and moths, and all other pollinating animals who play a vital role in production of managed crops and propagation of native plants and trees. I certainly hope that this report will bolster efforts to support educational and research organizations in their work toward encouraging local, state and federal authorities to set aside land for prairies, native grasslands, and wild space in general, and to manage that space in appropriate and sustainable ways. 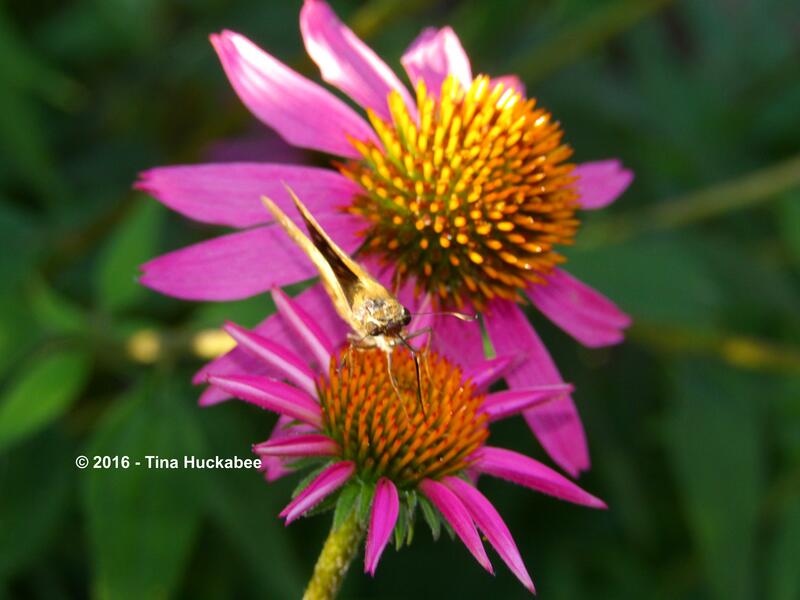 Skipper nectaring at Echinacea purpurea, Purple Coneflower. Refrain from pesticide and herbicide use. Not only will abstaining from chemicals save you money and time, but usually, these chemicals create more problems than they fix. 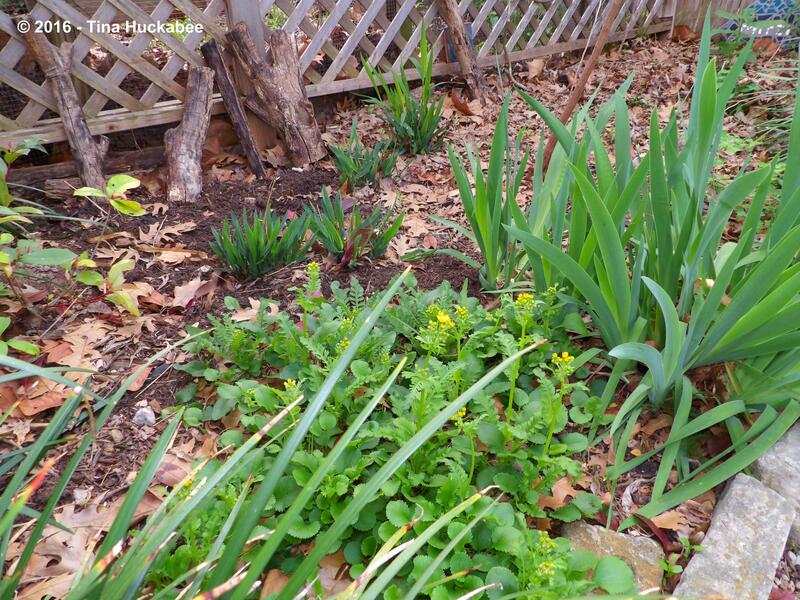 If you plant appropriately for your region, the need for chemicals in the garden decreases or disappears. Osmia ribifloris (? ), Megachilinae, sp. 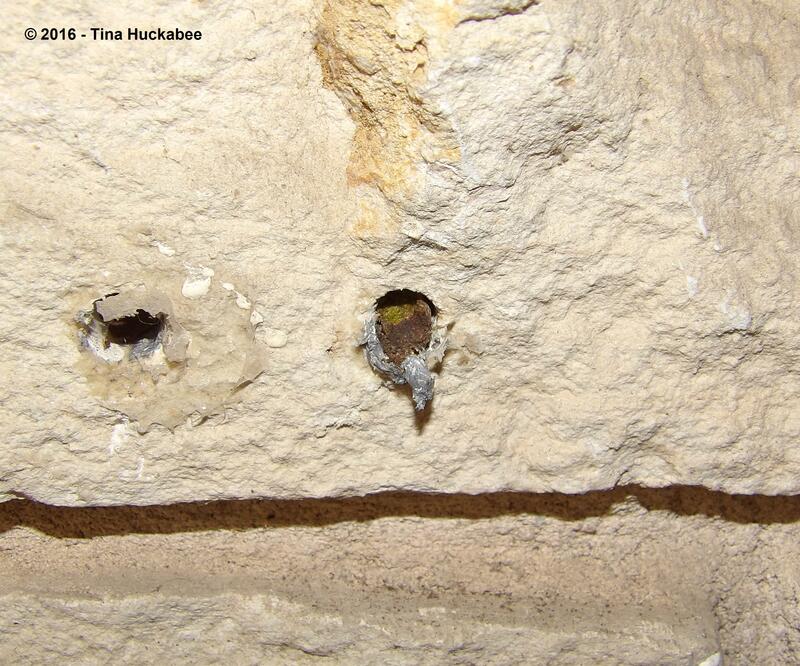 preparing a nest in the mortar of the outside wall of a house. Use native plants! There is no easier way to attract and sustain wildlife than to plant native plants–for pollinators, birds, bats, reptiles–every native critter will visit when their preferred food source is available. Where native plants are hard to find, plant non-invasive, well-adapted pollinator-friendly perennials and annuals. When replacing shade or ornamental trees, plant native trees; a large native tree is life-giving in so many ways. Your locally owned nurseries and Agricultural Extension Agent offices and websites are excellent sources of information on appropriate plants. 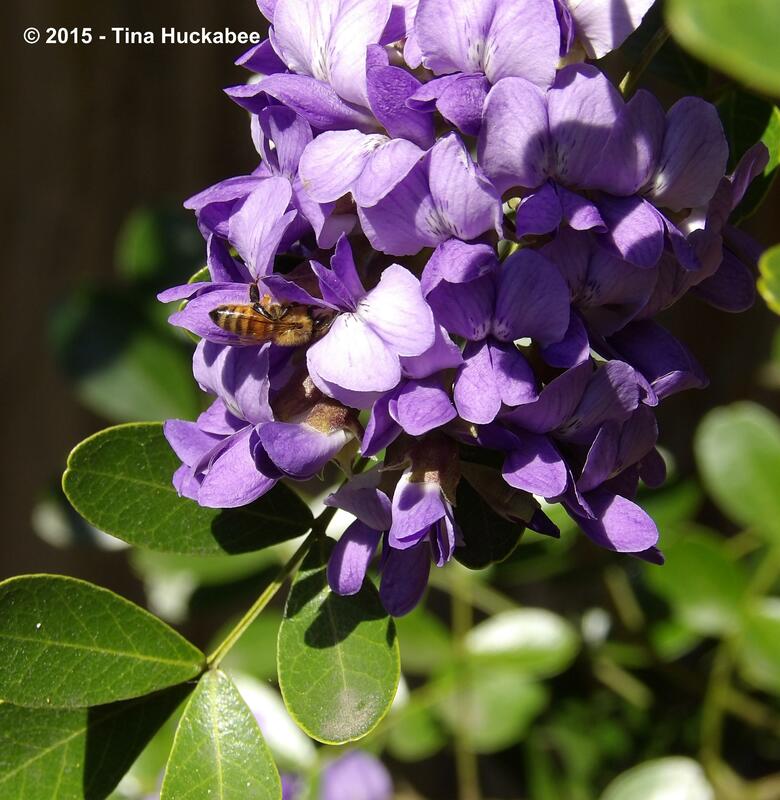 Honeybee working the blooms of a Sophora secundiflora, Texas Mountain Laurel. Leaf litter and rotting wood as part of the garden design and structure. Your garden doesn’t have to be wild to attract wild. No matter what garden style the gardener appreciates and aspires to, incorporating plants that are beneficial to wildlife–those providing nectar, seeds, berries, and cover–is easily accomplished as time and budget allow. Whether in a formal or a cottage garden style–or anything in between–using wildlife-friendly plants, pruning after seed production, and refraining from chemical use is the ticket to a successful and life-nurturing garden. And isn’t that what gardening and gardens are all about? The creative endeavor of nurturing and sustaining life and beauty. Provide water! As simple as a bird bath or as complicated as a series of ponds with attached streams and waterfalls, water is a requirement for life and should be a part of any garden. ‘Nuff said. 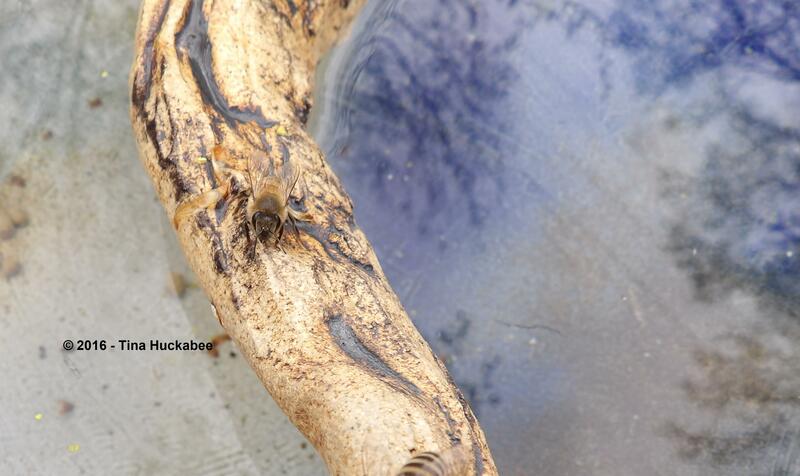 Honeybee drinking from a bird bath. There are already places in the world where, because of mismanagement of land and misuse of chemicals, there are no pollinators available. None. They’re all dead. Crops grown are hand-pollinated by people. Surely this is not what we want worldwide, but that scenario is exactly where we are headed. We can choose a different route and it doesn’t require great inventions or new technologies, but instead, thoughtful gardening and agricultural practices, as well as the political will to acknowledge and edit the environmental costs of industrialization. 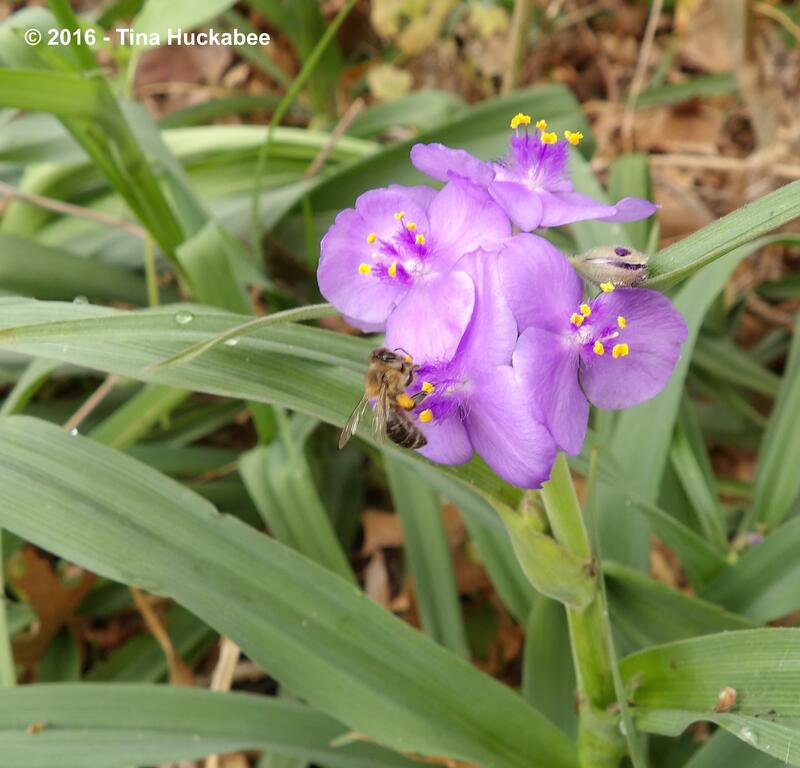 Honeybee gathering pollen at Tradescantia gigantea, Spiderwort. Please consider the health of your local environment when you plan a garden. Support private, municipal, and federal efforts to set aside land for wildlife. Our survival, as well as the maintenance of the remarkable and diverse biology of the Earth, depends upon our acting NOW. This is a solvable problem. Let’s solve it. Osmia ribifloris (? ), Megachilinae, sp. flying into an insect hotel, preparing a nest. Pollinators are our friends and co-workers. It’s in our interest to do right by them. 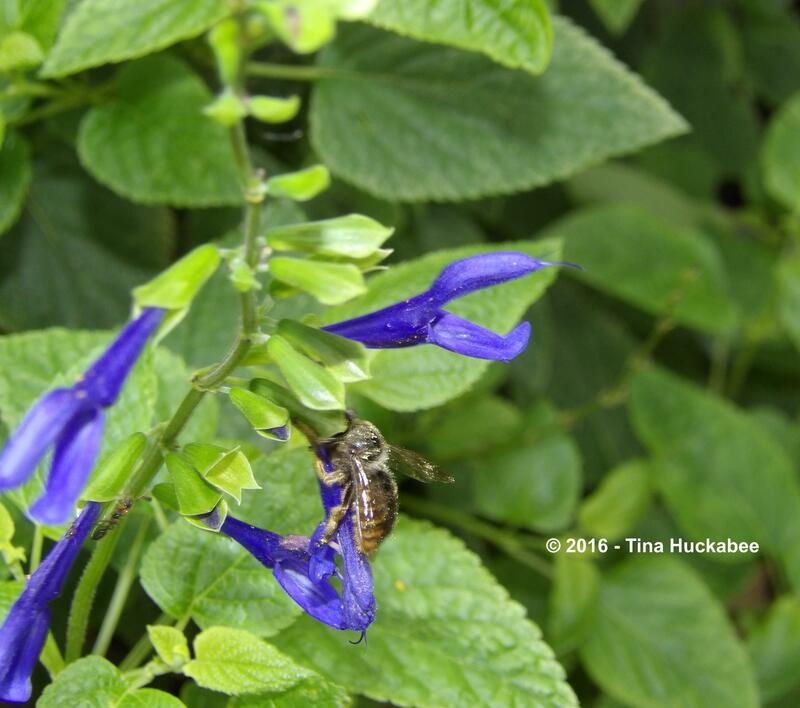 Xylocopa tabaniformis, Horsefly-like Carpenter Bee, at a Salvia guaranitica, Blue Anise Sage. 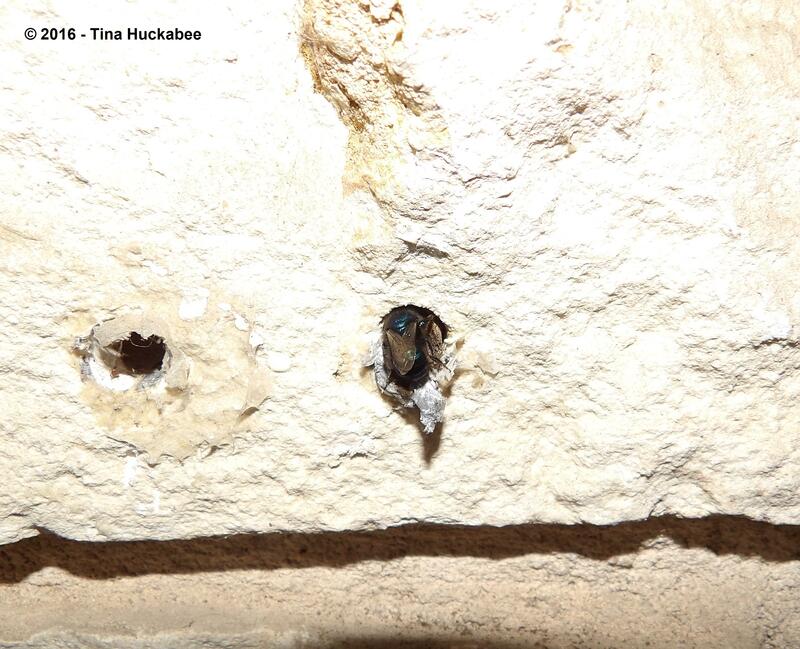 This entry was posted in Intergovernmental Science-Policy Platform on Biodiversity and Ecosystem Services, IPBES, Pollinator Decline, Uncategorized, Wildlife Gardening and tagged Biodiversity, Wildlife by Tina. Bookmark the permalink. Great post, and a critically important message. I know you think along the same lines as I do. All we can do is get the word out, often and succinctly. Thank you not only for this post, but for your entire site (reflecting years of personal practice) that gently educates and encourages every person who gardens, be it large scale or with a few pots on a balcony, to do so with wildlife in mind, using native plants grown without the use of chemical pesticides. As you point out, the problems resulting in the decline in pollinator populations will not be solved simply. 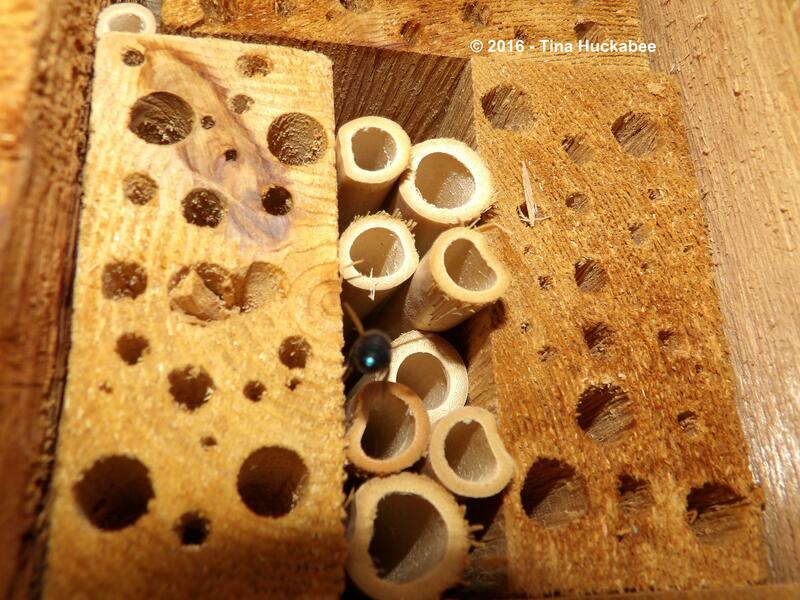 It is not a matter of “just don’t do this” or “always do that”, but rather a situation where many decisions combine to create the factors that lead to the ongoing support (or unfortunately the decimation) of pollinator populations. When a situation is this serious it is easy to feel discouraged, that there is no use in small gestures. In this case I believe quite the opposite is true, that every tiny gesture is not only helpful, but potentially salvific to some segment of local pollinator populations. Each one of us can try to educate ourselves and make better choices with our gardens and gardening practices. Reading this blog regularly is certainly a great step in that direction! Thanks, Deb! I think in the micro, this is an easier problem to address. I know in my situation, living in a neighborhood where, out of the 300 or so households, there are only a few that actually have true gardens as part of the landscape and where the major landscape feature is non-native turf, I’m continually amazed and humbled at the number of pollinators that gravitate toward my little home garden. Yesterday, in attempting to get photos for this post, I easily counted 4 native bee species (getting photos of those, well, that’s another discussion 🙂 ). It’s early in the season, not a lot blooming and yet, there they were, busy in their work. Just think what it would be if half of the households in my ‘hood planted more appropriately for this region and focused on plants for wildlife. The mind boggles. And it would be so simple for each homeowner/renter to have a small pollinator garden. As to the macro, that’s more difficult because there are a range of issues needing addressing: the “unintelligible noise” that ensues when someone suggests land be set aside and properly preserved, the moneyed interests who have the ears and votes of governmental authorities. The mind boggles here, too, but in a different way from the above paragraph. But, there are greater interests gathering and perhaps, we can stem the extinction tide. Great advice. The fun of a garden for me is not just the plants and flowers, but the “visitors” that are attracted to it. I couldn’t agree more–it’s those who require our gardens who truly make those gardens function. Thank you for saying this and even more so for your inspirational blog and garden. Lawns are a terrible burden on our environment and so ugly compared to gardens. Luckily, your neighbours still like trees and healthy trees do support a LOT of pollinators. Silver lining. Maybe another aspect to consider is the importance of changing our agricultural practices and consumer patterns. I once overlaid a map of where GMO seeds are planted (corn, soy and cotton) and found that it almost perfectly matched the traditional range of Monarch butterflies. The area is HUGE. Much bigger than space set aside for urban use I suspect. So while setting aside some land for pollinators is a nice idea, restricting or better regulating the use of herbicides and pesticides is key. That seems unlikely to happen so alternatively we must press for change through our purchases. If more people ate organic foods whenever possible and flat out refused to buy GMO foods/products we could make a significant difference. Small acts done by many can have large repercussions. It is happening too slowly for my patience but I have some hope. A few of the big multinational companies have started to remove food dyes because of market pressures, for example. Moms stopped buying those products so changes were made. We need to build on that win. I totally agree with all of the above. I don’t kid myself into think that a few gardens, or even a few million gardens, are the answer. You’re right, of course, that millions of acres of land (and it is in the millions) are essentially sterile because of big agriculture and its insistence on GMOs. And it will take many people and worldwide, choosing NOT to use GMOs in their food/consumer choices (and restaurants and other commercial enterprises) to do the same. Still, there is more awareness and pressure on these companies than there once was. And the pressure must continue. Thanks for posting this, Tina. I shudder at the thought that humans might wait too long to recover from some of the trends we’ve begun. I can’t imagine living in a place where we’d have to hand-pollinate plants for food. But it has happened and it could happen to us. I feel frustrated talking about this topic because so many people want to tune it out. But it’s so critically important. You’re welcome, Beth. It’s not only that they want to tune it out, it’s amazing that so many people don’t understand the ramifications of our agricultural practices and urbanization. But I think all we can do is push–write our elected officials, work and vote for for folks who do understand this serious problem, and hope that journalists will expose the issues engendered from the over- and mis-use of chemicals. Really important post Tina, as gardeners we can do much to help and provide individual sanctuaries – we need to encourage and campaign for joined up thinking and provide safe corridors – where both gardens en masse and our wider green spaces provide habitats with food, forage and shelter opportunities for wildlife to move freely. Amen, UK sister!! Any step, big or small, will improve this situation and it needs to happen all around our lovely little world. I believe it’s up to us now. We can’t wait for national governments or local councils to get the willpower or funds together for this. We have to act now. Collectively we can do a lot to help our native wildlife. I’m thrilled that I had a great response to the free seeds for wildlife campaign I ran from November to 28th Feb and I’ll be sending out the annual flower seeds this month. Around here schools are creating wildlife gardens and some roadside verges are left uncut. We are trying to make a difference which is a start I suppose. It’s amazing how many people think that chemicals are fine to use in the garden or within the wider landscape without a thought for the wildlife! Certainly, individuals have to step up and change the gardening paradigm from one that is chemically dependent to one that better reflects regional conditions. I don’t know about how it is across Europe or, specifically in the UK, but here in the US, there are HUGE–I mean really large areas of land that big agriculture businesses have effectively made sterile by their dependence upon GMOs and the paired use of herbicides, mostly Round-up. There has been political and economic pressure placed on these practices, but the land is bland and lacking in a diverse biological community. That must change–and soon. But gardeners like you, who model healthy practices, can change the tide of the chemical merry-go-round. We just have to keep at it. Yes, you’re absolutely right–we’re all in this together, lowly bee, high-born CEO ( 🙂 ). I wish more folks understood the connections of the bio-web–it’s so important. I’ve seen photos of your magnificent garden and I know that it’s pollinator nirvana. May other follow your lead! Excellent post and reminder to people about what can be done to keep pollinators happy. Really, creating small ecosystems is what it’s about. Our garden was originally landscaped by the previous residents (who also designed and built the house) and it was partly based on a Japanese garden complete with pond and self-feeding stream. It’s mostly low-maintenance, though unlike yours it does have a lawn in part of it. This isn’t an entire waste as the birds like it and it helps them find creatures like leatherjacket larvae that live in the roots of the grass. That’s not great news for the grass itself, but oh it helps the birdlife. As for the bees, we have more here than I’ve seen in many other places and I think it’s because we have a lot of cotoneaster which they adore, and also quince. Many butterflies too – a favourite plant of theirs is the ‘iceplant’ (Sedum spectabile). Thank you, Val! I believe that you’re probably right that small, patch-worked ecosystems will become the norm. The large swath of wild-space is more difficult to re-establish. My experience is that pollinators (and most other wild critters) will come, if what they need is available. Your garden sounds lovely and welcoming to a variety of wildlife. Excellent! But I did have a little laugh over your photo of leaf litter. Our yard is predominantly leaf (twig, peanut shell, branches etc) litter and only a very little well-kept garden. Yes, I am exaggerating: there’s probably no well-kept parts at all! Ha ha! I despair at perfectly coiffed gardens–how boring! I do keep borders defined and plant with thought…well, most of time. Okay, only some of the time.